This book takes the reader through some of the experiences of author, who is a seasoned veteran of the trade show industry. 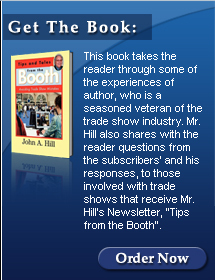 Mr. Hill also shares with the reader questions from the subscribers’ and his responses, to those involved with trade shows that receive Mr. Hill’s Newsletter, “Tips from the Booth”. The book also covers the Pre-show, Show and Post Show efforts that are so critical to a trade show success. For graphics, booths, printing, mailings, security, drayage, and general information he has solicited the help of some well know professionals with extensive experience in their fields of expertise. It is interesting, humorous and informative. 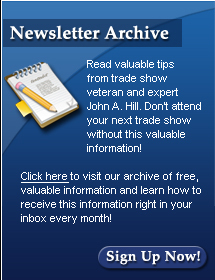 John A. Hill & Associates, Inc.
and fill out the following form. 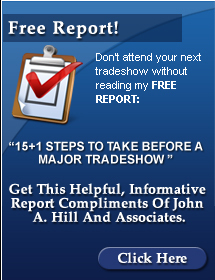 How many trade shows do you exhibit yearly? 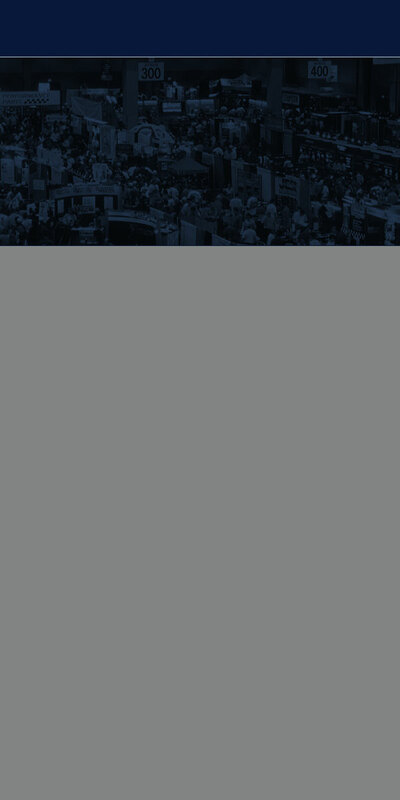 How many trade shows do you exhibit internationally? Do you want to subscribe to my newsletter, "Tips from the Booth"? If yes, please enter your email address. If no, leave blank.